Santa Fe, New Mexico, “City of Holy Faith” in Spanish, has many beautiful churches. Santa Fe’s Loretto Chapel is one of the popular attractions of this historic city. 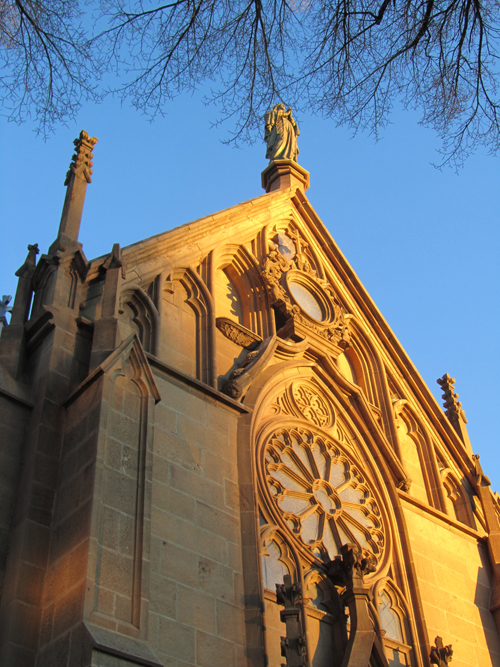 Just off the main Plaza, the Loretto Chapel is a Gothic Revival style stone building. It was commissioned in 1872 by Bishop Lamy of Santa Fe. With its European architectural details, some imported from France, the chapel reminds visitors of the Sainte-Chapelle in Paris, a 13th Century Gothic chapel. The Loretto Chapel was built as a convent chapel under the care of the Sisters of Loretto. If you saw the 1998 TV movie, The Staircase, you’ll know that the most interesting feature of the chapel is its mysterious spiral staircase. Why the mystery? Well, the staircase, leading to the choir loft, is amazingly designed with two 360 degree turns and no visible means of support. It is constructed with wooden pegs. There is a story that goes with the building of the staircase. According to the Chapel website, Legend says that to find a solution to the seating problem, the Sisters of the Chapel made a novena to St. Joseph, the patron saint of carpenters. On the ninth and final day of prayer, a man appeared at the Chapel with a donkey and a toolbox looking for work. Months later, the elegant circular staircase was completed, and the carpenter disappeared without pay or thanks. After searching for the man (an ad even ran in the local newspaper) and finding no trace of him, some concluded that he was St. Joseph himself, having come in answer to the sisters’ prayers. The chapel is maintained as a museum and wedding chapel. It has been deconsecrated as a Catholic chapel. The chapel is open to visitors Monday through Saturday 9am – 6pm and Sunday 10:30 – 5pm in the summer and winter the hours are Monday – Saturday 9am – 5pm and 10:30 – 5pm on Sunday. Some say the chapel can get crowded with visitors so going in the off season might provide you with a better experience. Of course if there is a wedding scheduled, the chapel will be closed to visitors. The entrance fee is $3.00. The Loretto Chapel is in the middle of the block on Old Santa Fe Trail. At the other end of the block is the lovely Inn and Spa at Loretto. There is an arcade of small shops and a restaurant. At the other end of the block in a garden area, there are vendors selling everything from steer hide rugs to jewelry and hats (handy in summer). Behind the chapel complex you will find the Loretto Lines tour company.